Its snowy, its cold. Your bed and pillows are beckoning. Its a dreary winter day, and there's nothing like a hot bowl of homemade soup to keep the winter blahs at bay. 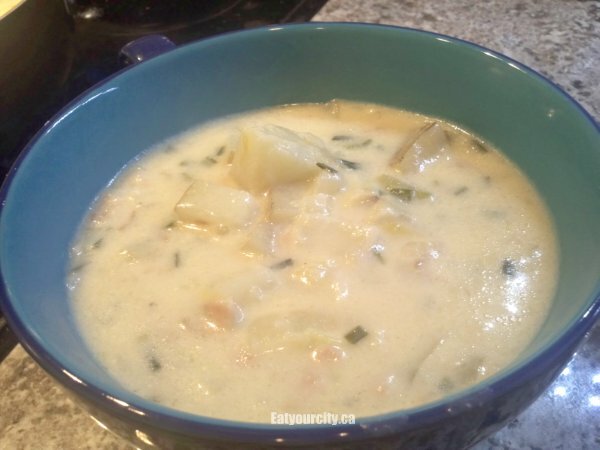 I don't want me (and all of you) to look like chubby michelin tires in the spring, so here's an almost guilt free recipe for a hearty creamy bacon potato leek soup. If you're vegetarian, feel free to omit the bacon, and double the onions or leeks for more flavour. 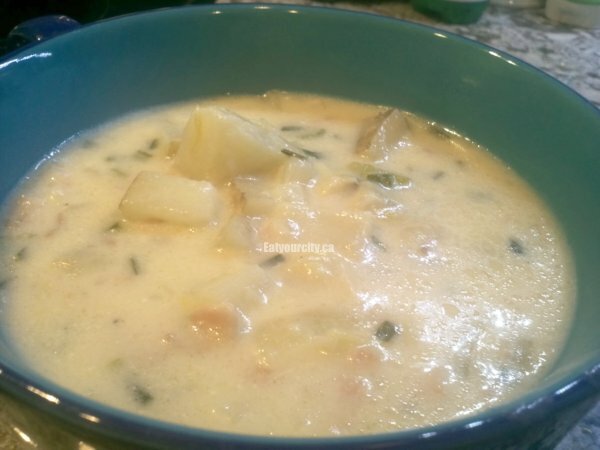 Most creamy potato leek soups call for cream. Heavy cream. I subbed it out with 2% evaporated milk (double the calcium of regular milk) and 2% regular milk. Put in just enough bacon for flavor (and not too many calories), and added in other vegetables to up the savory profile of this soup. A leek is a flavourful vegetable that looks like a green onion on steroids (don't worry, it isn't lol!). Make sure you cut off the roots of the leek and cut in half so you can wash all the dirt and sand out. Some folks even chop it up afterwards and soak in a bowl of water to get all the grit out. Basically, this is a lazy soup you can toss together in just under an hour (assuming you're not making the broth from scratch). I used a deep non-stick pan to prevent the milk from scorching and easy clean up.. I love easy. Feel free to puree up some or all of the soup if you like you're creamy - I mushed up some of the potatoes and left the rest intact cuz I like mine with more texture. Then you can sit back, enjoy and go phbbbbt at mother nature. Oh, and original recipe I super modified it from was for bacon lovers - you can add up to 1 full pound of bacon to this recipe. -8 medium potatoes, medium dice - I used Yukon Gold, but russets work too! 1) Wash (and peel if you want - I left the skin on cuz I'm lazy and more fibre) the potatoes. Dice into medium 3/4 inch cubes. In a medium pot, boil potatoes in the chicken broth until soft ~10min. Mash partially or completely if desired. 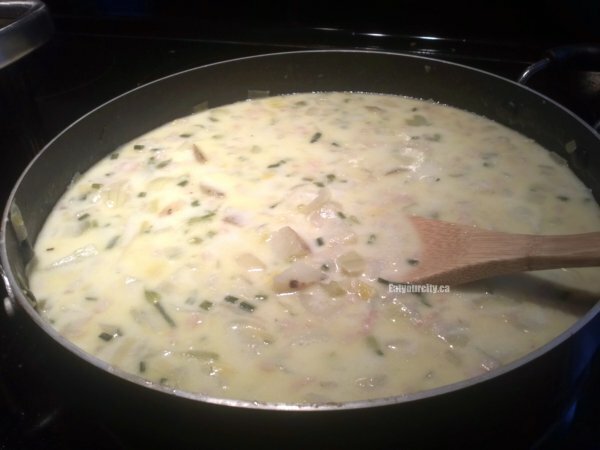 2) While potatos are cooking, dice up the leeks, onion, celery, garlic and bacon. Pan fry the leeks, onion, celery, butter, garlic, chives and bacon over med-high heat until the bacon is cooked through and all the vegetables are softened. Sprinkle in the flour and mix into the vegetable/bacon mixture. (This is a lazy roux). The mixture will look like its drying and thickening up as the flour cooks. 3. Add the bacon-vege mixture to the potato-broth pot and mix well over medium-high heat. Bring to a boil. 4. Stir in milk, salt and pepper to taste, and heat through. Serve immediately. You can garnish with extra chives and bacon bits if you like.